Hell hath no fury like a woman scorned. 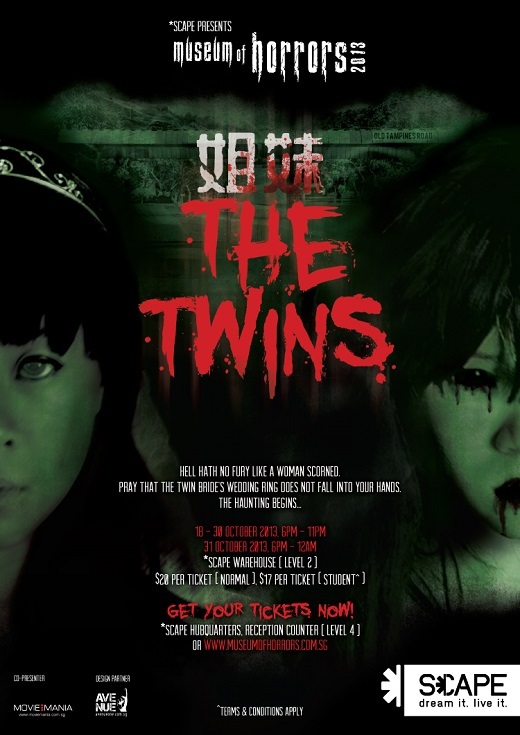 This year 2013, *SCAPE collaborates with Movie Mania and Singapore Polytechnic to create Museum of Horrors IV: The Twins. The story revolves around a pair of twin sisters, one of which was due to marry. However, before her wedding night, the bride was murdered by her sister in an act of resentment. Unable to accept the death of his fiancee, the groom turned delirious and arranged a duplicate wedding ceremony with his bride’s sister. Infuriated, the bride’s vengeful spirit possessed her sister and slaughtered the guests before ending her sister’s life. She now seeks vengeance and demands her missing wedding ring be returned to her. Wonder how gory and grisly props used in Halloween sets are made? Don’t miss the workshop on 5, 6, 12 & 13 October 3pm! Spend a day with us to learn prop production from professionals and take part in the workshop to get tips on applying creepy makeup for your Halloween celebration this year. Tickets can be purchase at the venue and online. For further information and to buy event tickets, visit Museum of Horrors website.